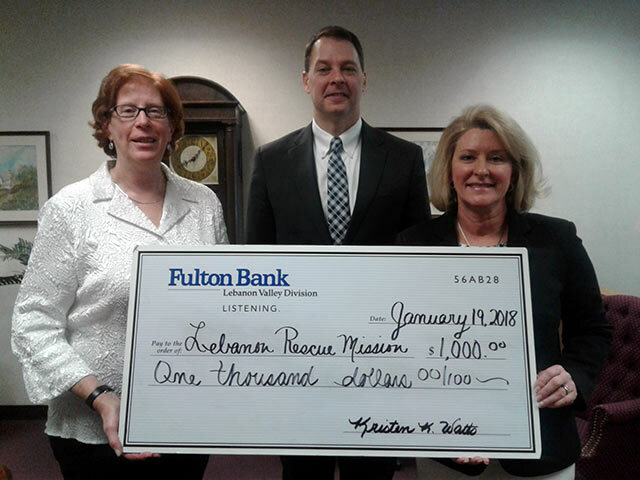 Lebanon Rescue Mission would like to recognize and thank Fulton Bank Lebanon Division for their support and generosity toward our Annual Food Drive 2017. Wow, we received a $1,000 donation check! This donation will assist us in filling our food pantry and continue on with our mission…to serve the homeless, impoverished, and less fortunate in our community. Pictured below in the middle is Aaron Whysong, Retail Sales Manager, Lebanon & Capital Divisions; on the right is Kristen Watts, Market Leader, Commercial Market Executive, Lebanon Division; and to the left Lebanon Rescue Mission’s Executive Director, Susan Blouch, receiving the check. We are very blessed and grateful! « Thank You, DAS Companies, Inc.